Want to read later? Download a beautifully formatted PDF version of The Lean Publisher. The freelance workforce is developing rapidly, as is the publishing industry’s reliance on outsourced professionals. To derive benefit from this evolving publisher–freelancer relationship, structural changes need to be made in-house to accommodate “out-of-house” employees. This white paper examines the publisher–freelancer relationship from the creative, management, and legal angles, and identifies how publishers can navigate the growing freelance economy successfully. 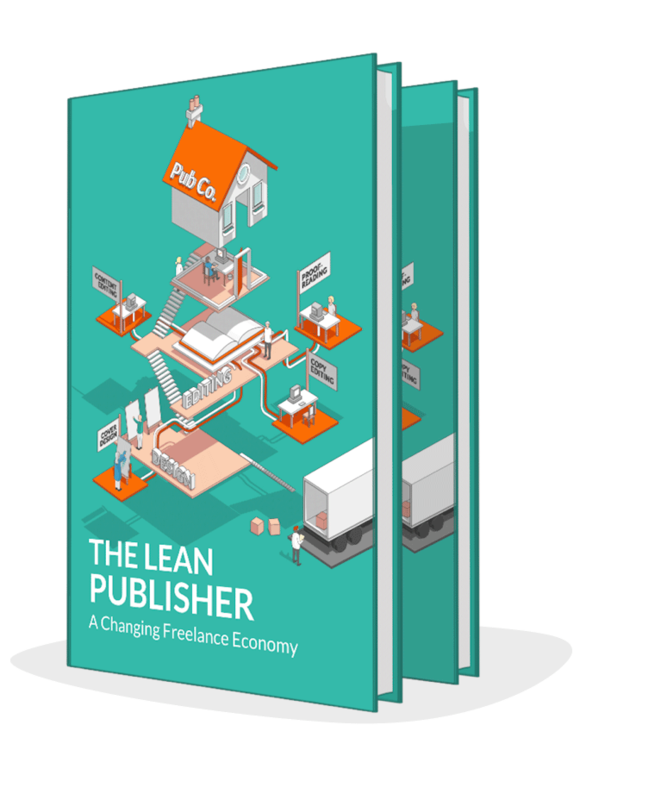 It features contemporary commentary from a variety of publishing executives and freelancers from the United States and the United Kingdom, as well as predictions for the future of lean publishing and the freelance economy. The freelance economy is exploding and has been for some time. According to the 2017 Deloitte Global Human Capital Trends survey, 51% of executives around the world reported that their organizations planned to increase the use of flexible and independent workers over the next three to five years. Upwork’s Freelancing in America 2016 survey revealed that 35% of the American workforce was made up of freelancers, while IPSE’s Exploring the UK Freelance Workforce in 2016 report confirmed that two million people were working as freelancers in the United Kingdom. This explosion is rippling its way into publishing houses, and it has the potential to change their internal structures. While independent contractors are hardly a novelty in the publishing industry, they have historically served as a hidden resource called upon in times of crisis. These days, they are the cogs that keep the gears of the publishing world turning. Such changes have led to a corresponding boom in the use of online marketplaces, like Reedsy, which offer freelancers the opportunity to promote themselves and provide employers with an effective way to scope out prospective talent. What makes Reedsy unique, though, is its niche focus: experienced freelancers are hired in an environment catering specifically to the needs of publishers. legal issues and the potential implications of working with freelancers. The paper concludes by looking forward and posing a few predictions for what publishers might expect next, including an increased reliance on freelancers, evolving worker classifications, the establishment of procurement departments in publishing houses, project management tools tailored for publishing, and internal training for freelancers. The challenge of maintaining a consistent brand while increasing reliance on freelance talent is a common concern of publishing houses, in particular with regard to how the change might affect their creative vision. However, if undertaken efficiently, outsourcing need not be a threat to, or potential dilution of, a publishing house’s brand; in fact, hiring freelancers for particular services can actually bolster a brand’s strength. Canadian author and columnist Russell Smith observed that, “There was a time when a particular editor’s artistic vision and personal whimsy defined a publishing house’s program. That editor would be trusted to make decisions that were intellectually consistent and not necessarily the most lucrative in the short term.” The traditional practice for publishers to have in-house acquisition and developmental editors and outsource copy-editors and proofreaders is a good example of how turning to freelancers for specific services can allow in-house staff more time to focus on decision making that furthers the company’s vision. For instance, Wiley’s Dummies imprint, one of the most recognizable brands in publishing, offers its freelancers comprehensive manuals to which they can refer when copy-editing and proofreading, in order to ensure standards are maintained and requirements are met. For Helen Wicks, Creative Director at Bonnier Publishing, maintaining an in-house style is all about scheduling when to bring a freelancer on board for a project: “Our artistic heritage and artistic integrity are very important parts of Bonnier. Often, books develop as they are put together, and we like that process to occur in-house, in a much more labor-intensive way. However, once a style has been set, I’m happy to put work out.” In other words, hiring freelancers for projects that have already been developed, and for which most of the “artistic” decisions have been made, removes the worry of inconsistent branding. Whereas full-time staff provide value in terms of their in-house and industry knowledge and standards, working with freelancers can give publishing houses a leg up by providing service-specific knowledge. This is especially true when distributing content in new formats or producing work for unfamiliar markets. According to the Fourth Annual E-book Survey of Publishers, compiled by Aptara and Publishers Weekly, about 55% of publishers outsource work due to lack of internal capabilities and resources. And Wicks confirms that, in instances where a specialist is needed, Bonnier does look to trusted freelancers to develop new projects from the get-go. “Often, books develop as they are put together, and we like that process to occur in-house, in a much more labor-intensive way. According to Lauren Finger, Managing Editor at Bookouture, “It is up to the people in-house to have clear ideas of our standards and ensure that the work we are receiving from freelancers meets those standards.” Following this argument, the end result of a project that relies on freelancers is often only as good as the brief that goes out to them at the outset of the project and the communication that follows. Therefore, publishers can ensure that outsourcing does not disrupt in-house branding by taking the time to carefully convey both project-specific and critical institutional knowledge to freelancers as they are brought on board. It can be assumed that in-house staff undertakes market research in order to decide on a creative strategy for books; if this work is already being done, publishers should ensure that it is shared with the freelancers who make a project happen. Working with freelancers need not only be a backup option when a publisher’s to-do list has grown too large for in-house staff to handle. Bringing on outside professionals from all areas of the globe can boost creativity and ensure that in-house teams do not burn out or grow stagnant with regard to innovation. As Tania Wilde, Pan Macmillan’s Head of Editorial Services, says, “We often look for fresh eyes at the copy-editing and proofing stages in order to raise helpful queries and make valuable suggestions. In-house teams are often too close to the project by then.” In this way, an outside perspective doesn’t necessarily decrease the consistency of a brand, it breathes new life into it—a benefit that shouldn’t be overlooked, as companies that foster creativity are three times more likely to see 10% growth in annual revenue than companies that do not (McNeal, 2016). While many articles and reports have heralded the return of print books by pointing to the “slump” in publisher e-book sales over the past two years, others have been quick to point out that those celebrating the return of paper are jumping the gun (Ingram, 2015). True, according to the Association of American Publishers, major publisher e-book sales fell by nearly 25% in 2016. However, sales of independently published e-books have been growing, which instead suggests that publishers are losing e-book market shares to indie authors and Amazon imprints, rather than that the success of digital books and their consumption is dropping overall. While the sales of traditionally published e-books may have been dropping in comparison to their print versions, according to the 2016 Trade Publishing by the Numbers report from the author-maintained website Author Earnings, the sale of e-books on Amazon in general grew by 4% in 2016. Therefore, as the report advocates, perhaps the more pertinent perspective for publishers looking forward is not print versus digital but bricks and mortar versus online. Some publishers have already embraced this challenge: for example, in 2011, Simon and Schuster announced the addition of a digital sales team, thanks to the rising sales of e-books. Other companies have developed from the ground up around the e-book market: Open Road Media, for instance, was established in 2009 to mine publisher backlists for books that had never been distributed in e-book format, so that they could then purchase the rights and publish the books as e-books for the first time. In this way, Open Road took advantage of the burgeoning e-book market to introduce a new demographic of readers to older books. In order for publishers to reclaim some of the digital market, it is important to cultivate a brand that is not only focused on B2B, but also on consumers—after all, 41% of traditionally published print books sold in the United States were purchased online in 2016 (Author Earnings, 2016). This requires acquisition and production to develop in a way that strategizes around audiences, as opposed to just businesses, and, within this approach, outsourcing specialists will be more important than ever—and not just for technical services. In general, freelancers with a knowledge of digital marketing will be crucial in every department for publishers who are looking to maintain a brand that preserves their creative heritage and integrity while still keeping in mind their new buyers: the public. Many publishers do not require a full-time staff year-round, and can therefore cut costs by having a smaller in-house workforce and simply outsourcing at the time of need to freelancers. In the first place, outsourcing can reduce costs becauses expenses devoted to training in-house staff are decreased. This is no small detail as, according to Training magazine’s 2015 Training Industry Report, large companies spent an average of $12.9 million on training, midsize companies invested about $1.4 million, and small companies averaged about $350,000. Outsourcing eliminates the administrative time spent on setting up health benefits, insurance, and paid vacation time. Furthermore, commissioning freelancers for specific projects can decrease the amount of time devoted to sourcing and hiring in-house staff, which is typically much more time consuming as hiring a full-time employee is a greater and more long-term commitment. Lastly, because freelancers often work remotely, outsourcing reduces the need for large amounts of office space and lowers office supply costs. But, in order to benefit from the decreased commitment and costs of hiring freelancers, publishers must have the appropriate systems and processes in place to ensure that in-house staff responsible for hiring freelancers are not continuously occupied with onboarding duties. Publishers have tackled this challenge in a number of ways, depending on their size, resources, and philosophy. In the smallest publishing companies (those with one to five employees—the category to which the vast majority of the industry in the United States belongs), the publisher or managing director, acting as a project manager, oversees the whole production process. Depending on the structure of the company, such project management will either be shared among respective departmental team members (e.g., each editor will oversee the editing process of the books they work on) or fall to a dedicated managing editor, head of production, or project manager. While the outsourcing of freelancers does ultimately need to be managed in-house by a person, turning to project management systems can make the job of that person easier, and [can] allow them to maintain a continued connection with freelancers—even after a project is complete—so that company knowledge and branding are preserved. Marketplaces play an important role for publishing houses looking to outsource at scale, as they help companies grow their pool of freelance specialists quickly. This is why more and more publishers are now turning to marketplaces instead of local agencies to hire freelancers. Legitimate marketplaces thoroughly vet freelancers before representing them, thereby supplanting the less efficient word-of-mouth recommendation system many publishers have traditionally fallen back on for sourcing professionals outside of their already-established pool of freelancers. A comparison of several such marketplaces currently available for publishers to use is presented below. In addition, marketplaces absorb some of the risk and labor involved in outsourcing. According to the study A Labor Market That Works: Connecting Talent with Opportunity in the Digital Age prepared by McKinsey Global Institute, adoption of online talent platforms can increase output by up to 9% and can reduce costs related to talent and human resources by as much as 7%. For instance, when hiring freelancers, companies commonly must prepare several customized documents, such as statements of work, contractor agreements, requests for proposals, project descriptions, etc. The administrative work that accompanies these documents (creating, sending, and signing them) can be time consuming. On many marketplaces, including Reedsy, contracts are automated, and therefore the whole process is streamlined for the hiring publisher. It seems almost paradoxical that an endless array of communication options are available to us, and yet the biggest concern publishers have regarding outsourcing remains disorganized communication. The challenge seems to be in abstaining from micromanaging, while also ensuring that freelancers thoroughly understand a project and managers are kept in the loop throughout. Many managers, including those at Bonnier, Macmillan, and Faber, rely mostly on email and phone/Skype calls to communicate with freelancers during a project. The upside of this is that email is already an ingrained part of our daily lives, and for communication between publishers and freelancers to be efficient and effective, it should be part of a routine that is easy to incorporate into your schedule. However, while email may be a natural communication device, it is not an effective project management tool. For that, there are numerous options: Trello, Asana, Basecamp, Wrike, Freedcamp… the list goes on. Moreover, not only do these tools facilitate task management, many are also efficient communication resources. The following table compares the project management features offered by a representative selection of these systems. Testing the various platforms that aim to streamline communication between managers and workers may require considerable time and effort, but in the end, finding the one that meets your needs will undoubtedly help you become much more efficient and organized in your approach to project management. Callisto is an independent publishing company that uses proprietary technology to mine data for topics of consumer interest. Authors are employed on a freelance basis by the company to write books based on these identified potential “best-selling” topics. The whole book process, from the writing stage through production relies on freelancers: authors, developmental editors, copy-editors, proofreaders, production professionals, such as compositors and indexers, cover designers, illustrators, etc. are almost always outsourced. In order to manage such a large and diverse number of freelancers, Callisto has implemented Basecamp as its project management tool of choice. Jenny Croghan, Vice President of Editorial Production at Callisto. Several Reedsy freelancers who have been contracted by publishing companies also cite communication as one of the bigger challenges to an effective collaboration, as illustrated through the following advice. In a time when the boundaries between freelancers and full-time employees have become blurry, it has never been more important for publishers to have a thorough understanding of the legal implications of working with freelancers. And, in an industry where hiring freelancers is as commonplace as it is in the publishing industry, companies would be wise to play it safe: lower taxes or avoiding costs of employee benefits are simply not worth the risk of a costly, time-consuming dispute with tax authorities. It is likely that the enduring boom of the freelance economy will lead to a correspondingly continuous development of legislation designed to protect the livelihoods of freelancers. The following sections outline current legal implications employers should be aware of when hiring freelance professionals. In the United States, the Internal Revenue Service (IRS) estimates that employers have misclassified millions of workers as independent contractors. In order to prevent companies from hiring freelancers to do the work of full-time employees for the purpose of reducing taxes, the IRS has published a form that misclassified employees can submit to report their employers. Type of relationship: Are written contracts or employee-type benefits (i.e. pension plan, insurance, vacation pay, etc.) available to the worker? Will the relationship continue, and is the work being performed a key aspect of the business? Keeping these three aspects of an employee’s role in mind can help publishers ensure they are not engaging in accidental misclassification. In the United Kingdom, there are also legal implications to working with the same freelancer over and over again. The IR35 tax law was created with the aim of identifying individuals who are engaging in full-time work while classifying themselves as freelancers in order to pay reduced taxes. However, IR35 currently affects contractors, rather than companies. Control: If contractors are told by their clients where, when, and how to complete the tasks documented on their contracts, they pass the control test. Substitution: If contractors cannot send replacements, or substitutes, to complete the tasks for clients on their behalf, they pass the substitution test. Mutuality of obligation: If contractors expect clients to give them work, and clients expect contractors to complete it, they pass the mutuality of obligation test. If a contract is “inside IR35,” the contractor is actually an employee, and a deemed salary calculation should be run to declare PAYE and National Insurance on 95% of the contractor company’s income, allowing up to 5% to cover the costs of running the company. As of April 2017, companies in the public sector have had to ensure that contractors they commission are genuinely self-employed. This new measure might be transferred to the private sector at some point, too, which could lead to some publishers paying a potentially hefty price if Her Majesty’s Revenue and Customs was to successfully challenge their assessments. Where the United Kingdom differs most significantly from the United States in regard to classification of employees is that there is an intermediary status between employee and self-employed; this is known as “worker” status. In a nutshell, all employees are workers, but not all workers are employees. A worker who is not considered an employee is an individual contracted to personally provide certain services but who is not entitled to a contract of employment. A self-employed individual is contracted to provide certain services, but the circumstances of the completion of these services is entirely up to them—they can even have someone else complete contracts on their behalf. The issue here is that self-employed freelancers hired for short-term contracts on an ongoing basis by a publisher run the risk of having to be classified as workers, due to the long-term work relationship that exists. A noteworthy example of this can be seen in the October 2016 employment tribunal ruling that stated Uber must pay drivers in the United Kingdom a national living wage and holiday pay. Publishing processes and formats have been changing, and the freelance economy has been growing. Combined, these two continuing trends are shifting the industry. Exactly how the shifts will ripple through the internal structures of publishing houses is still up for debate. Nevertheless, we have come up with five predictions regarding how the growing freelance economy might continue to change the publisher–freelance relationship. An increasing number of publishers’ operations will be structured around the use of freelancers. As of 2016, 55 million freelancers were working in the United States, which equates to 35% of the American workforce. Together, they earned an estimated $1 trillion in 2016. Since 2014, the number of working freelancers has been growing by almost a million per year, so it’s not hard to imagine that this number will continue to grow. According to Upwork’s Freelancing in America 2016 survey, around 63% of people report choosing to freelance, as opposed to becoming a freelancer due to external circumstances. 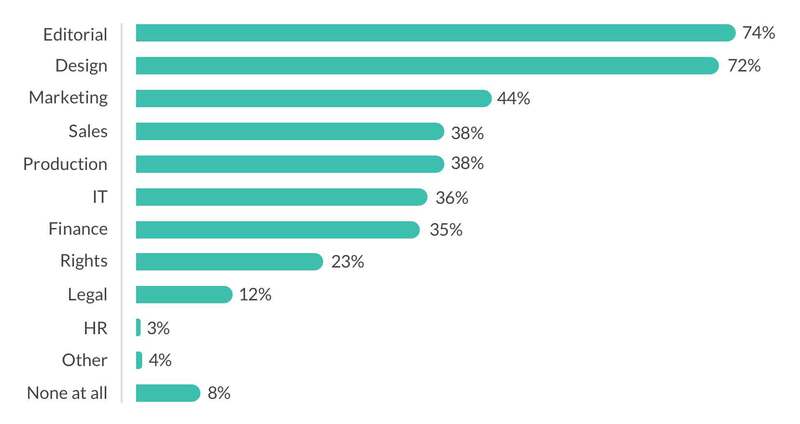 The reasons people become freelancers are varied, but the top three reported were: (1) wanting to be their own boss, (2) schedule flexibility, and (3) location flexibility. With a boom occurring in the freelance economy, and a storm of lawsuits being filed against companies like FedEx, Uber, Lyft, Handy, etc., it is also not hard to imagine the potential evolution of a standard work contract between a freelancer and a publisher. In the future, what will differentiate a non-employee from a quasi-employee (someone who is not full-time, but is tied to an individual company as a freelancer)? Will this force a middle ground to be classified between a non-employee and an employee (much like the “worker” status in the United Kingdom), so people who enjoy freelancing can maintain their independent status and devote longer periods of time to an individual company without having to become an employee simply to avoid misclassification? If more and more publishers do start to rely on freelancers instead of full-time employees, will these ongoing freelancers, or quasi-employees, begin to expect certain benefits from employers? There will be an establishment of teams specifically designed to manage freelancers. Publishers may start instituting procurement departments or dedicated HR resources focused solely on liaising with and onboarding freelancers. These teams will likely be comprised of managing editors or production managers from each department who have a knowledge of both their specific department’s skill set and of freelance workforce management. Such roles will likely become the first- or second-most important ones in a publishing house (after acquisitions). An IRS crackdown on worker misclassification has been underway since 2013, so procurement departments will not only vet which freelancers are being hired, they will also address compliance and legal issues to ensure all workers are appropriately classified. There will be a rise of project management tools specifically tailored to the publishing industry. Such tools do already exist (e.g., Basecamp, Trello, and Asana), but, as Callisto’s Jenny Croghan explains, “You have tools like Basecamp that are general project management tools, and then you have platforms that allow for an in-work flow of managing freelancers. I would imagine that, at some point, there will be more platforms that cater to publishing and allow for streamlining of the process between publishers and freelancers. There’s definitely a market for it.” However, publishers would need to be careful with tools like this. Requiring freelancers to detail their exact tasks on a daily basis could feel quite controlling, and could again blur the lines between a freelancer and an employee. Outsourced staff might also start to feel they are being micromanaged, which can hinder creativity. There will be more training for freelancers. With unsteady print growth, declining e-books sales, and diminishing revenues, many publishers are looking to their marketing and sales teams to improve their market shares. Less frequently, they look to the production aspects of publishing—an area where vast improvements can be made by adopting a flexible, lean publishing model that effectively incorporates freelancers. Whether publishing houses are poised to take advantage of the changes brought about by the growing freelance economy or they see the publisher–freelancer relationship continuing as it has done before, it is important for companies to be aware of the potential effects of this changing economy, and to prepare for them. Andrius Juknys, Head of Central Sales Services, Thames & Hudson; Helen Wicks, Creative Director, Bonnier Publishing; Jenny Croghan, Vice President, Editorial Production, Callisto Media; Katie Salisbury, Freelance Editor; Kim Yarwood, Freelance Editor; Lauren Finger, Managing Editor, Bookouture; Leah Brown, Freelance Editor; Lloyd Jones, Studio Manager, Pan Macmillan; Maleah Bell, Freelance Editor; Matt Haslum, former Consumer Marketing Director, Faber & Faber; Perris Davis, Freelance Editor; Tania Wilde, Head of Editorial Services, Adult Publishing, Pan Macmillan. 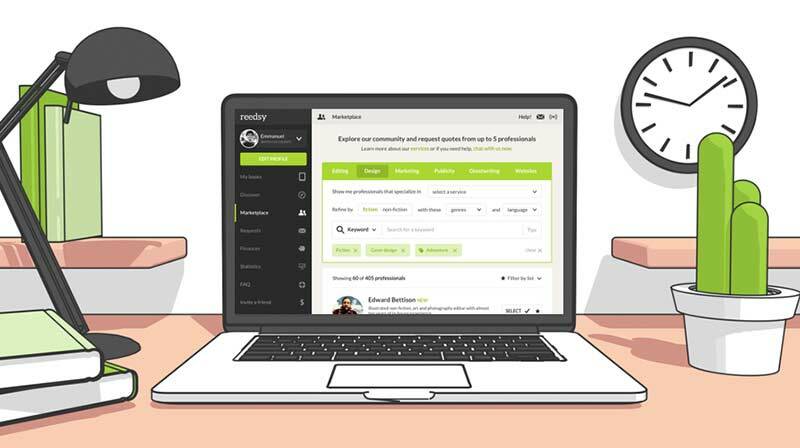 Reedsy is an award-winning community of more than 40,000 book publishing professionals, authors, freelancers, and publishing houses. Our objective is to help publishers create high-quality books by connecting them with the world’s best editors, designers, marketers, and ghostwriters. If you would like to learn more about Reedsy visit our homepage.